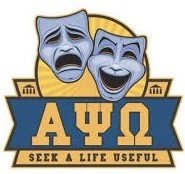 Entirely produced and executed by Alpha Psi Omega, students work collaboratively to find their own vision and voice. Mature themes and language. Latecomers cannot be seated. Tickets at the door. General seating. $3​ for students; $5 all others. Cash and credit cards only. Thurs., Apr. 18, 7:30 p.m.
Fri., Apr. 19, 7:30 p.m. Sat., Apr. 20, 7:30 p.m.